The SL-G700 supports Bluetooth, Wi-Fi, and Apple AirPlay and it is also compatible with streaming services, such as Spotify, Tidal, and internet radio, and functions such as Google Chromecast and Google Assistant. The optical disc transport features a triple chassis structure to ensure accurate reading and to prevent the vibration from transmitting to the outside of the mechanism. Moreover, the SL-G700 has a stable, aluminum die-cast disc tray with a high-vibration-damping to ensure high-accuracy disc playback. 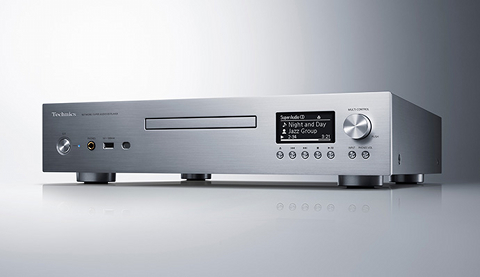 There is a dedicated disc playback mode, in which all power supplies, except those to the circuit blocks necessary for SACD/CD playback, are shut off, thus improving the quality of sound from the disc media. For the clocking of the DSP section the SL-G700 uses an entirely isolated power supply, based on Technics' extensive experience with battery-powered audio-related circuits. Additionally, the audio system clock is supplied from an Ultra-Low Jitter clock generator. The new player features a DSP capable of upsampling, converting 44.1-kHz/16-bit music data recorded on CDs and lossy compression audio sources such as MP3 to high-res signals of up to 192 kHz/32 bits. For the D/A conversion an Asahi Kasei Microdevices' top-of-the-line DAC AK4497 is used with a discrete-circuit analog filter, featuring low-noise transistors and thin-film resistors. As a result, the SL-G700 provides highly linear and faithful sound reproduction without omitting even the smallest nuances recorded in the source, the company stated. The SL-G700 is equipped with a dedicated D/A circuit for headphones which is independent from that for the main analogue output. This circuitry incorporates Technics' original sound processing LSI, the JENO Engine (Jitter Elimination and Noise-shaping Optimization). Furthermore, the SL-G700 is equipped with an operation optimization system that automatically turns on the JENO Engine when a pair of headphones is connected. The SL-G700 uses a four-section construction with partitions installed between the circuit blocks according to the signal level handled and circuit type. This eliminates interference between circuit blocks, thus achieving clear sound quality. The chassis rigidity due to this construction also suppresses the vibration of electrical parts, thereby suppressing any deterioration in sound quality.